By now, eating and drinking local in Santa Barbara County is easy. With our plethora of local farmers and chefs who embrace local ingredients, along with the more than 200 wineries and over 21,349 acres planted to wine grapes, you can easily find locally grown food, wine and food products to enjoy every day of the year. Now, you can include sparkling wine too! Sparkling wine is a labor of love for many Santa Barbara County vintners, and the number of local producers has been growing slowly and steadily over the last 10 years. Today, with the popularity of an ancestral method resulting in a sparkling wine called Pét-nat, there are over 50 producers of sparkling wine in the county, making bubbly wine available here year-round. Pét-nat is short for pétillant naturel, or natural bubbles, and is the oldest (and easiest) way to make sparkling wine. If differs from traditional Champagne production in that the wine is bottled before the fermentation is complete (so only 1 fermentation happens, partially in the bottle), no sugar or yeast is added for a second fermentation, and it’s usually unfiltered, and can be made from a multitude of grape varieties. It also takes a much shorter time than the traditional method, meaning more winemakers can get in on the bubbly action. Pét-nat’s bubbles typically don’t last as long as traditional sparkling wine, and the flavors can be all over the map, instead of the classic style and flavor profile you get from the méthode traditionnelle. 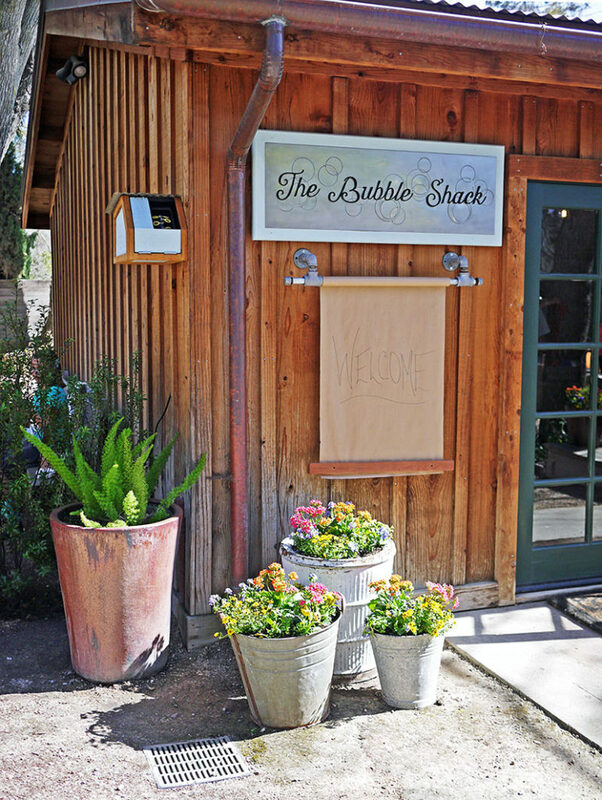 Los Olivos has a high concentration of these fun, fresh bubbles, as well as traditional sparkling wine, so it’s a perfect place to go bubbly tasting this Spring. Pét-nats include Carhartt’s sparkling rosé of Grenache, Dreamcôte’s 3 different pét-nats (Sauvignon Blanc, Riesling and Verdejo) and Solminer, also with 3 different bubblies (all certified organic and biodynamic: Riesling, rosé of Syrah and Sparkling Syrah). Some of the traditional sparklers in town are Blair Fox (also rosé made from Grenache), Coquelicot’s Sparkling Riesling, Fess Parker’s Fesstivity label (3 different sparkling wines from classic Blanc de Blancs to sparkling red Grenache plus a 30th Anniversary Magnum of sparkling Cuvée, all available at the Bubble Shack), Toretti Blanc de Noirs, and E11even Blanc de Blancs. Plus, you can also get small-lot Loubud Blanc de Noirs & Goat Bubbles from Flying Goat (some of the oldest bubbles in the County) at local wine shop Community Craft. 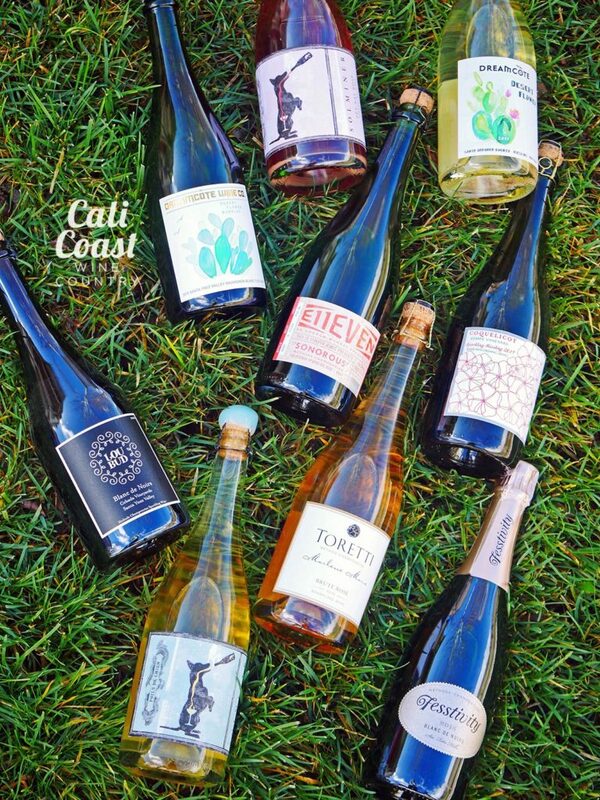 Find more Santa Barbara County bubbles on our local sparkling wine map, and celebrate Spring in Los Olivos: pop some local bottles! This is Fess Parker’s all bubbly, all the time tasting room with three different sparklers on their tasting menu (it’s only open Friday – Monday only). 2016 Brut Rosé also coming soon! This rosé of Grenache is crisp and fruity; just ask and they will pour you a taste! The 2017 is coming out soon, but you can still buy older vintages now. Carhartt now offers a sparkling rosé of Grenache made in a the méthod ancestral, creating a wine called Pét-Nat, or pétillant naturel. Try it in their new location in town! Note: Pétillant Naturel, or Pét-Nat, is an even more ancient way to make sparkling wine than the widely-used méthod traditionelle or méthod champenoise originated in Champagne, France. In the méthod ancestral, the wine is bottle before it even finishes its first fermentation, so developing carbon dioxide as it goes. It’s not disgorged, often unfiltered and can be made from any grape variety. 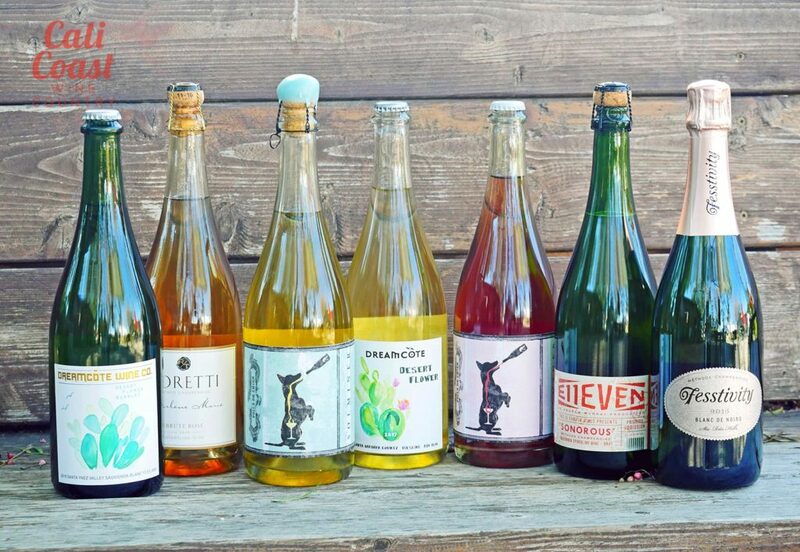 Community Craft doesn’t make its own sparkling wine, but it carries local cult favorites Flying Goat (Goat Bubbles), Loubud Blanc de Blancs, Solminer Pét-Nat and Combe Pét-Nat (from the Trousseau grape, a join project between Rajat Parr and Pete Stolpman). Sparkling Riesling from Coquelicot is available now! Made in the Méthode-Champenoise by hand, the wine is made from organic grapes in their Solvang vineyard. In addition to still wine and hard cider, this effort from Brittany Zotovich also includes another Pét-Nat sparkling wine, “Desert Flower” Sparkling Verdejo. Also available are 2 other Pét-Nat sparkling wines: Sparkling Sauvignon Blanc, and Sparkling Riesling. This is a classic blanc de blanc from winemaker Andrew Murray, with glasses or bottles for purchase at either location, sparkling tasting only at the E11even tasting room in Los Olivos. At Roblar, you can taste both the classic Sparkling Blanc de Blancs (Pinot Blanc) and Sparkling Rosé (Pinot Noir and Pinot Blanc), and buy them by the glass or bottle. These wines are sourced and made in Sonoma County. 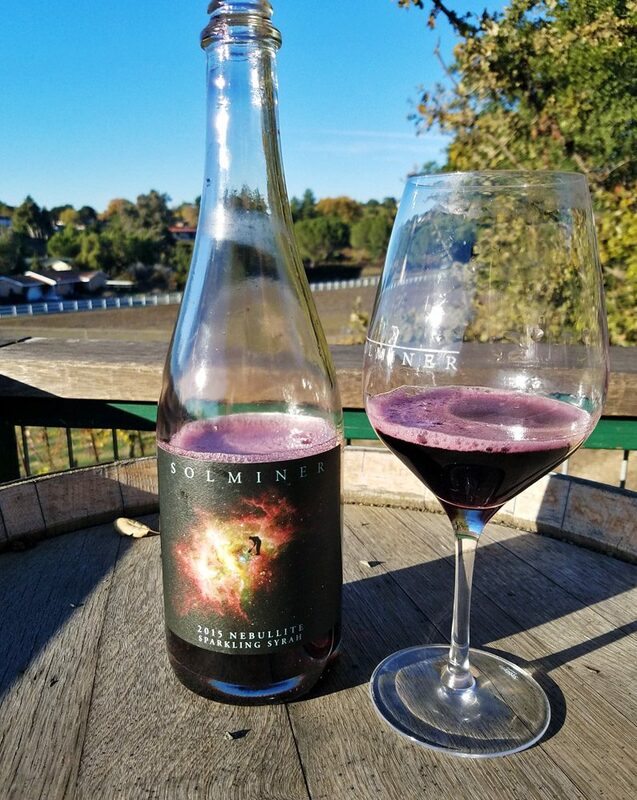 Solminer is the newest tasting room in Los Olivos, and is located at the flagpole at the center of town, in the same building at Kanea Wines (just north of the post office). Solminer makes 3 different Pét-Nats as well. 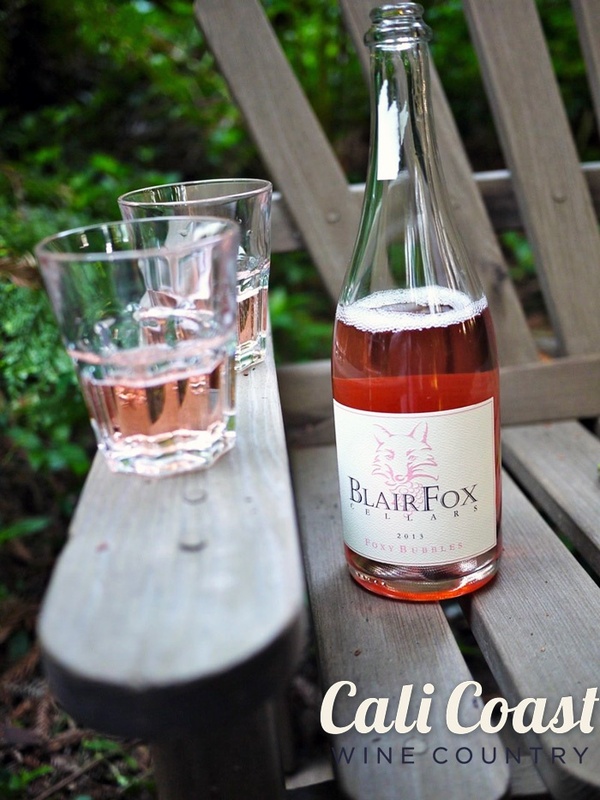 The Sparkling Rosé of Syrah is exceptionally bubbly, and has a lovely earthy and fruity flavor. Their Sparkling Riesling offers something different to bubbly lovers – it is dry and citrusy, also floral with delicate bubbles. Vincent has a very dry Blanc de Blancs-style Brut bubbly made from 100% Chardonnay. It is available by the glass and if you ask for a taste, you’ll probably get one. These wines are sourced and made in Sonoma County. Vincent is also open on New Year’s Day. Zinke has a fun sparkler from sister label Friend & Foe. It’s great for a large toast with pals, or even to make some simple sparkling wine cocktails! This wine is sourced and made in Sonoma County. See map of all Santa Barbara County sparkling wine producers here. 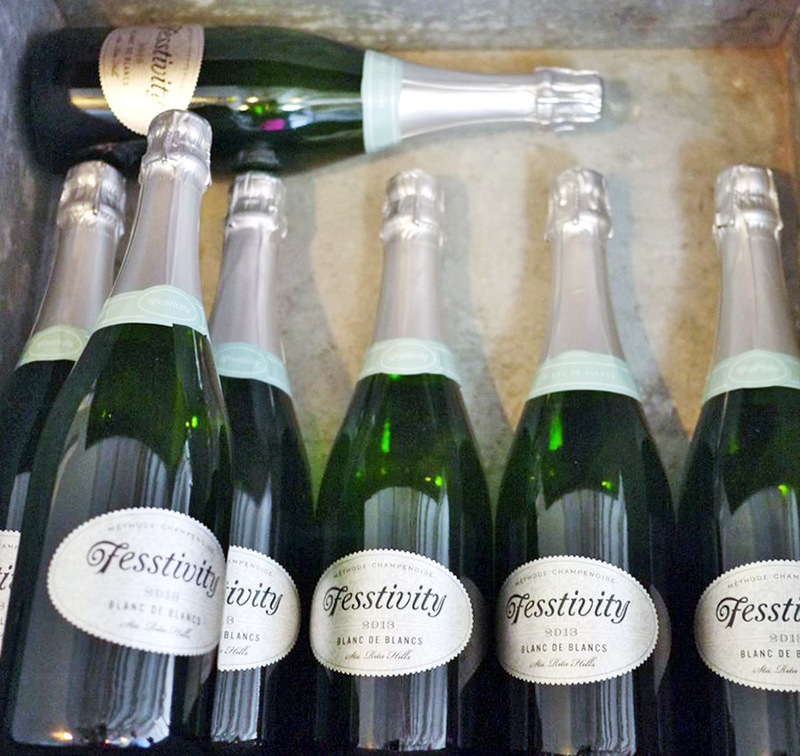 Fesstivity sparkling wines are a collaborative effort for Parker siblings Eli Parker and Ashley Parker Snider. Their first release of Blanc de Blancs, Brut Rose and Blanc de Noirs have proven to be great expressions of their shared vision of fresh and exciting wines from the finest Chardonnay and Pinot Noir vineyards in the Santa Rita Hills, AVA. This is Fess Parker’s all-bubbly, all-the-time tasting room in Los Olivos with 3 sparklers on their tasting menu (open Friday – Monday only). This year, The Bubble Shack celebrates the Fess Parker Winery’s 30th Anniversary with a 1.5L bottling of 2015 Fesstivity Anniversary Cuvee. For those of us who’ve been in love with the winery, grounds, view and elegant wines of Biddle Ranch Vineyard for the past two years, we now have one more reason to pine and gush — bubbles! Note: This winery is just one of 40 different sparkling wine producers in San Luis Obispo County! Right near the entrance to Edna Valley in San Luis Obispo Wine Country, Biddle Ranch sits on 17 acres of grapes and a minimalist tasting room fashioned from a vintage barn. It’s surrounded French-style gardens: olive trees, lavender, oak trees an grapevines. And now they have released their non-vintage sparkling wine, made entirely from Chardonnay grown in Edna Valley, and bottled in August 2018. This wine could easily be called a Blanc de Blancs: the classic Champagne style made only from white wine grapes in the Champagne region of France. This wine should satisfy any Champagne lover with its yeasty notes, flavors of tart green apple, fine bubbles, and crisp, elegant finish. It’s clean, with just a hint of almond, and absolutely delicious. Locally-made sparking wines can be very expensive. Following all the steps of the labor-intensive Méthode Champenoise or Méthode Traditionnelle costs the winery quite a bit per bottle, so this one’s a great deal at $50. It’s known by many names: Champagne, Bubbly, Sparkling Wine, Cava, Champers & Bubbles. California Sparkling Wine can’t be called Champagne — it’s not from the Champagne region of France — but it’s made in the same methode traditionelle, or method champenoise, used in Champagne. But San Luis Obispo’s “champagne” is also delicious…and it’s local! Download the San Luis Obispo & Paso Robles Sparkling Wine Map here. 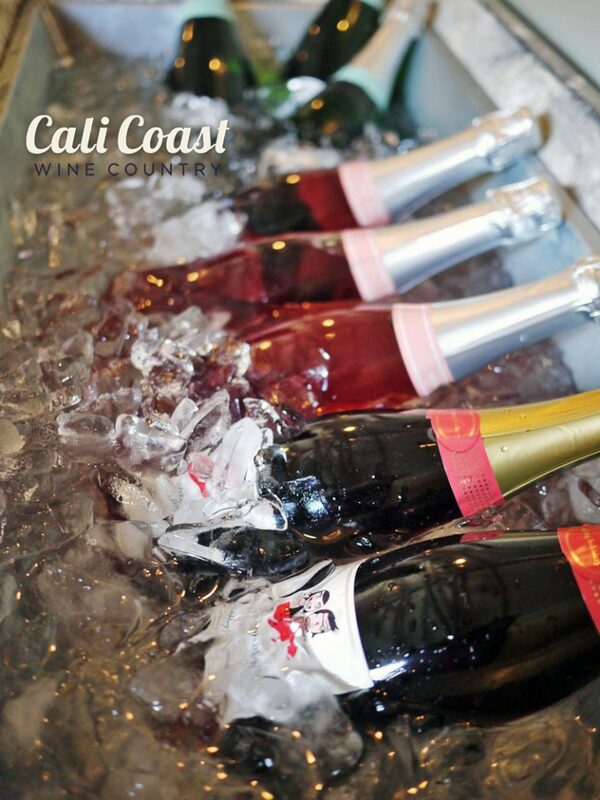 San Luis Obispo county has over 30 sparkling wine producers, from Paso Robles wine country to the wine trail right around San Luis Obispo itself and even in Morro Bay. Champagne from France is made only of Chardonnay, Pinot Noir and Pinot Meunier, but sparkling wine can be made out of almost any grape. 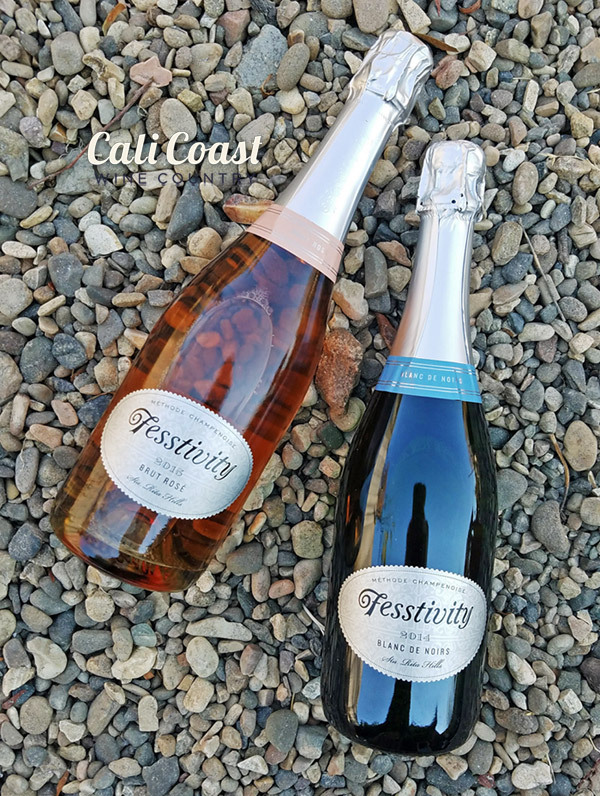 San Luis Obispo county has a large range of sparkling wine producers from the French classics at Laetitia Vineyard & Winery to Italian Proseccos and sparklers from San Antonio Winery. There’s even a sparkling Viognier, a sparkling Marsanne and a sparkling Grenache. Now you can use the San Luis Obispo Sparkling Wine Map for you to find them all: which local wineries make sparkling wine, and most important, where you can taste. Some producers don’t make enough quantity to have bubbles on a regular tasting list, but you can always ask at the winery. If they have some bubbles available; they’re likely to pour them for you. And if you like the producer’s white wines, you’ll probably like their Sparkling Wine. Paso Robles is a large area, so make sure you pick up a Paso Robles winery map before heading out to taste some bubbly. In San Luis Obispo wine country, you can hit all the producers in one day, but it’s nearly impossible in Paso Robles. Download the SLO County Sparkling Wine Map here. Contact me if you’d like copies for your tasting room! It’s known by many names: Champagne, Sparkling Wine, Bubbly, Bubbles, Cava or Champers. California Sparkling Wine can’t be called Champagne — it’s not from the Champagne region of France — but it’s made in the same methode traditionelle, or method champenoise, used in Champagne. But Santa Barbara’s “champagne” is also delicious…and it’s local! Santa Barbara county has perfect conditions and grapes to make high-quality Sparkling Wine. Santa Barbara county is one of the world’s premier growing regions for Chardonnay & Pinot Noir – 2 of the main grapes in traditional Champagne. And lucky for us, there are more than 40 Sparkling Wine producers in the county trying their hand at it. Now you can use the Santa Barbara Sparkling Wine Map for you to find them all. Many producers don’t make enough quantity to have bubbles on a regular tasting list, but you can always ask at the winery. If they have some bubbles available; they’re likely to pour them for you. 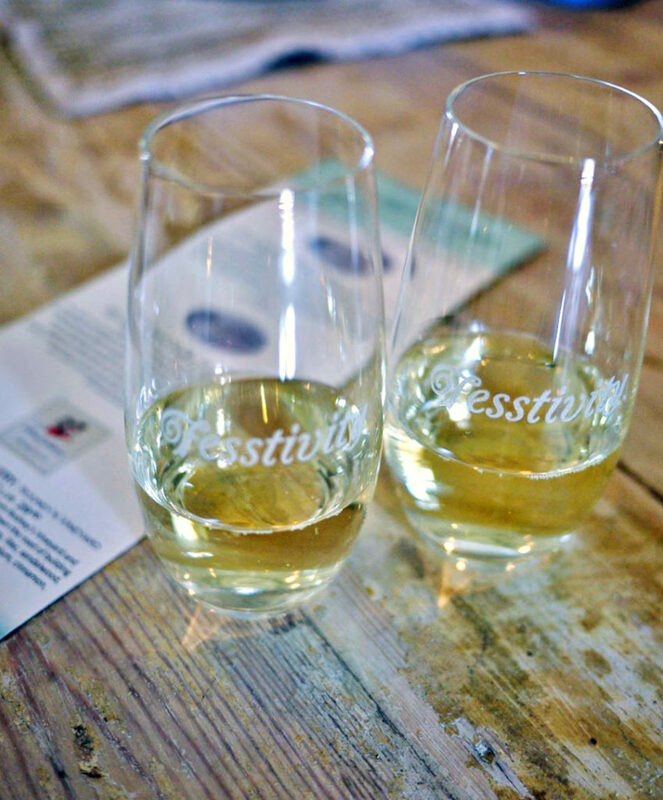 A good guideline: if you like the winery’s white wines, you’ll probably like their Sparkling Wine. 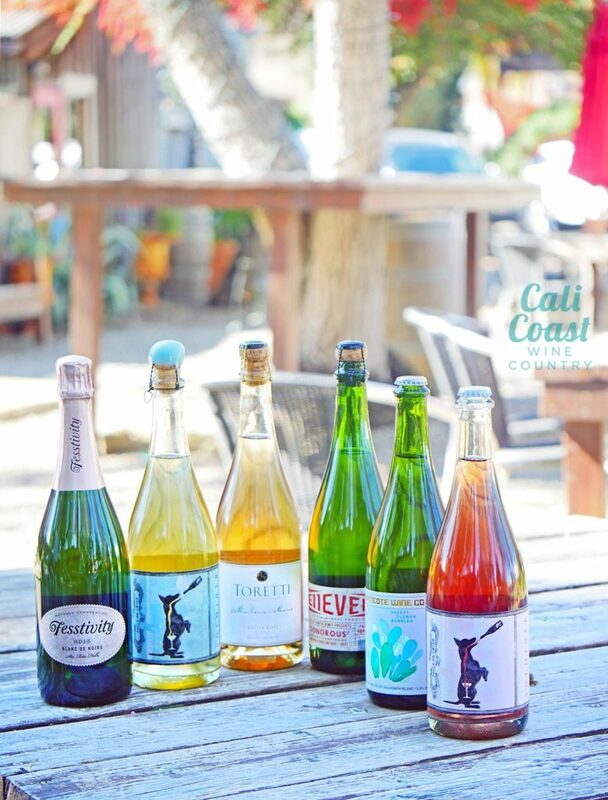 You’ll find Sparkling wine in Santa Barbara, Summerland, Los Olivos, Solvang, Santa Ynez, Buellton, Lompoc, Santa Maria Valley and Los Alamos, with more on the way. Even wineries without tasting rooms and getting into the bubbles business – the online-only producers are from some of the county’s highest-rated winemakers. Download the Santa Barbara Sparkling Wine Map. 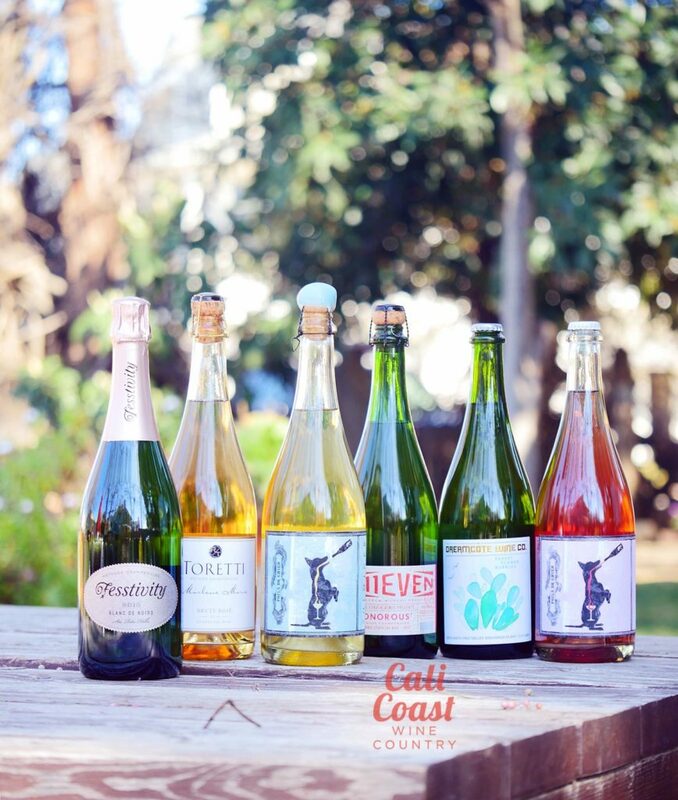 10 Days of Sparkling Wine: Central Coast Local Bubbles! We have so many amazing sparkling wines right here on the central coast, there’s no need to look further afield for New Year’s Eve bubbles. With about 30 sparkling wine makers in Santa Barbara county and about 20 in San Luis Obispo county, this coastal region in California can really stand up to real Champagne. Below is my list of 10 of my favorite sparklers! 1. Laetitia – 7 different sparkling wines! Laetitia has a heritage going back to the early 80s, when their wine was produced under Maison Deutz, a Champagne maker in France. Since 1997, Laetitia Vineyards & Winery has been the Grand Dame of sparkling wine on the central coast, now with 7 different bottlings. From their classic Blanc de Blancs and Blanc de Noir styles, as well as a sparkling rosé and more yeasty styles, you’re sure to find something for everyone. These wines can be tasted every day in their tasting room and they also have a Sparkling Wine club. Perfect for anyone who loves bubbles. Laetitia photo by Toki Lee. Flying Goat Cellars has a long history of quality Pinot Noir, and they’ve been hand-riddling, disgorging and bottling sparkling wine since 2005. Currently, they have a lineup of 5 sparkling wine classics of Goat Bubbles: Rosé (a fruity Pinot Noir), Blanc de Blancs (Chardonnay), Blanc de Noirs (Pinot Noir), Brut Cuveé (Pinot Noir and Chardonnay) and Crémant (a tart fruit Pinot Blanc). These sparklers can be tasted at their Bubbles Bar every weekend in Lompoc. Another small-production winery creating each bottle by hand, with a perfect lineup expressing each style of Champagne. Perfect for the slightly irreverent sparkling wine lover. In Santa Barbara county, the only place to taste a flight of sparkling wine every day is Riverbench Winery‘s tasting room in downtown Santa Barbara. They make 3 different sparklers: Blanc de Blancs, Blanc de Noir (a rosé) and a semi-sweet Blanc de Blancs. From their Santa Maria-focused Chardonnay and Pinot Noir program to their certified sustainable farming practices, the quality here is really high. Perfect for Burgundy (Chardonnay and Pinot Noir) lovers. Sea Smoke is renowned for their Pinot Noir… and I mean in a major cultish way. With that reputation for cool climate Pinot Noir, we’re lucky they also make a sparkling wine, called Sea Spray. Palmina Winery makes some of the best Italian wines outside of Italy, but it’s located in the Lompoc Wine Ghetto in Santa Barbara wine country. Winemaker Steve Clifton also makes much of the wine you might be enjoying under other labels including many restaurants. Lumina is made from the dark, tannic Nebbiolo grape and makes a surprisingly elegant sparkling rosé with lots of flavor and structure. They also make a sparkling Malvasia Bianca (more aromatic and floral) and a sparkling Barbera (red, fruity bubbles). These are perfect for the Italian wine lover. Derby Wine Estates in Paso Robles makes a variety of interesting, refreshing varietal wines and blends, in a super-interesting building. The family got their start growing grapes in 1998, gaining the farming knowledge needed to make great wines. 10 years later, they launched their own label. Now located in the historic Almond Growers Association building in downtown Paso Robles, they continue to create high-quality wines and a lovely pink sparkling wine made of Pinot Noir. Perfect for the Paso wine lover or pink bubbles lover. A winery born out of the love of wine, Kessler-Haak started as a backyard operation for Dan Kessler. Now farming 2.5 acres in the Sta. Rita Hills, Kessler-Haak produces a quality Chardonnay, several Pinot Noirs, a dry Riesling and a Syrah. They opened a tasting room in the Lompoc Wine Ghetto where you can find their Brut (made in Blanc de Blancs style) and Brut Rosé (made in Blanc de Noir style), both paired with a jazz CD. Perfect for the jazz lover or Sta. Rita Hills wine aficionado. Clavo Cellars specializes in single-varietal, bold wines in Templeton (near Paso Robles) and makes this sparkling wine from Grenache. But it’s surprising for a Grenache: this sparkler is the dryest on this list! Made with no sugar/dosage added, it reminds me of an Extra Brut Champagne. It’s supremely refreshing. Plus, the winery donates $1 of every bottle sold to cancer research. Perfect for those who want to give back and really love extra-dry bubbles. Mosby Winery focuses on Italian varietals and have an extremely impressive lineup. Most wines are made in Santa Barbara county (just outside of Buellton), but some are made in Italy and shipped over. They have 2 sparkling wines: California bubbles made from Cortese and Italian sparklers made from Erbaluce and Vernaccia. All are delicious, but the Stelline di Cortese is the local one, and it’s a real steal. It’s best wine for the price, and reminds me of a real Prosecco, so I can drink it every day. Perfect for the Prosecco lover. 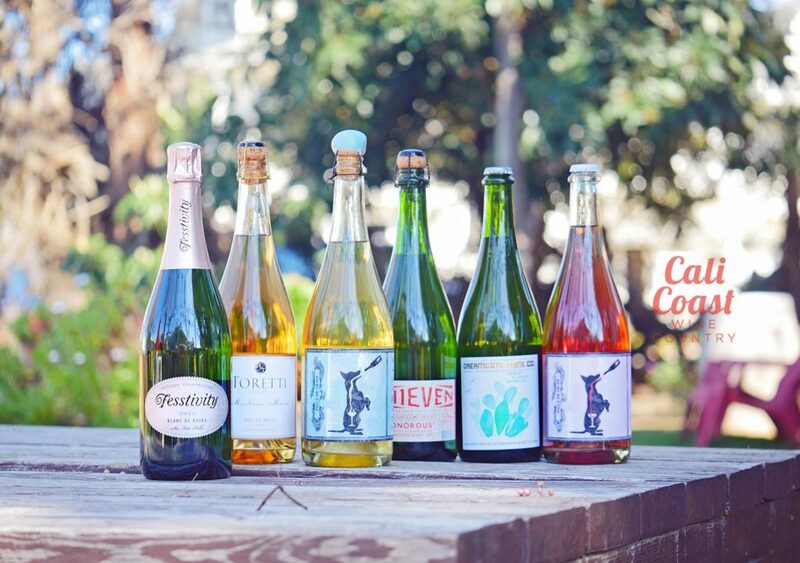 If you love sweet Champagnes and sparkling wine like Asti, you’ll love Carmody-McKnight‘s Pomegranate Cuvée. Making estate wines in Paso Robles for over 25 years, they make a traditional sparkling cuvée with grapes grown on chalky soil (like in Champagne) and age it in the bottle for up to 10 years. In the meantime, they wanted something bubbly to drink! Pomegranate Cuvée was born, made from the original sparkling cuvée mixed with pomegranate. Soon, a citurs honeysuckle cuvée will be available. Perfect for those who love sweet sparkling wine or dessert wine.